Welcome to Psychic Development for Beginners. Do I have Psychic abilites? This is a common question that I hear often. Everyone has Psychic ability but not everyone has the awareness of how to tap into those senses. Having Psychic abilities is very natural for all of us. Being Psychic is just like Intuition but at an elevated level of consciousness. Just like Intuition we can either choose to develop our gifts or ignore them. Tapping into Psychic abilities can be quite overwhelming, especially when it happens to come to without much effort. I know first hand how confusing it would feel when I was first trying to understand my own abilities. Being Empathetic can sometimes feel incredibly isolating and lonely. You may find it difficult to feel normal or comfortable within this world. I remember I didn't always have the support I needed so it is important to me that you have that support and guidance when necessary. This class is designed to help you uncover and embrace your gifts. The more you put focus on understanding your abilities, the more you will be able to find clarity where there was possibly confusion. Your abilities, with the right guidance will allow you to blossom in life. You may also develop into a deeper Psychic connection and maybe even a connection to Spirit Mediumship. You may be someone who has incredibly strong Psychic and Empathetic abilities but are still unsure as to what do with them. Everyone has Intuitive and Psychic abilities and with focus, study and practice it will grow and expand. Being Empathetic and having Psychic abilities can be overwhelming and tiring, especially when you do not fully understand it. The benefits of taking a class will help you learn how to balance your abilities and ground them when necessary. 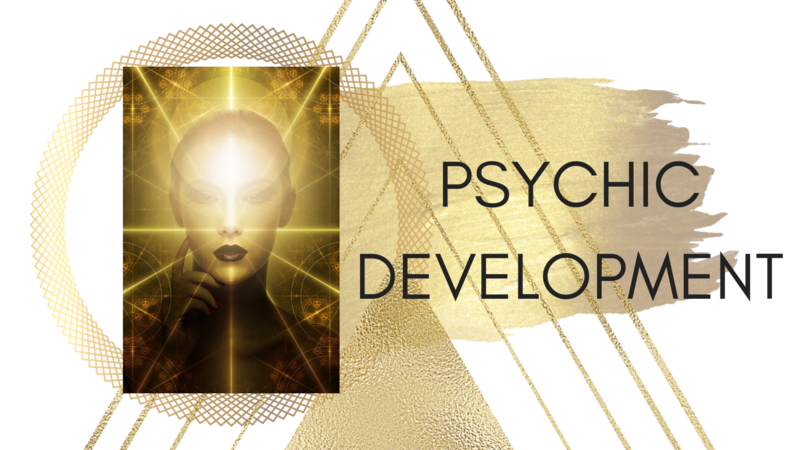 Psychic Development Level One Course is an 8 Week Program. This course is designed for people that are already aware of their Intuition but wish to develop more of their Psychic senses. You will lifetime access to this course. This course is designed for all levels of development, whether you are just beginning to tap into your abilities or you are already able to connect and communicate with spirit. This course is designed for all levels and is created so that you can take your time in understanding Psychic abilities. 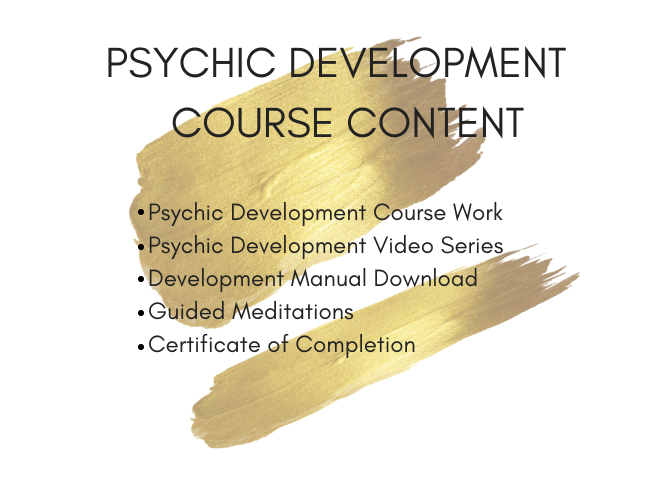 This class will help you build a strong foundation for all future development within your Psychic and Mediumship studies. This course will teach you how to grow into your abilities by removing blocks. You will also be guided on how to balance out your physical with your spiritual body so that you have the strength to access your abilities. You will learn about the use of all of your Clair Senses, your Chakra System, the mechanics of Psychic work and how to slow down enough to focus more intently. You will be taken through Intuitive exercises and practices to strengthen your senses. You will learn how to separate your ego from your higher self which is a huge part of spiritual studies. You will build trust in your Psychic abilities thus allowing them to grow. Each week will you will be given work that will challenge you yet help you realize your own strengths. It takes courage to accept your abilities so if you are truly ready to begin your journey then allow this series to be your starting point. You have the options to either learn in your own time with the self study program, or take the group class for more live education with me and other classmates. Group classes consist of more activities and exercises as well as being able to really engage within the group and ask me direct questions. Self study maybe an option for you if you have limited time and are more comfortable within a private setting. You may also prefer a more stylized advance study with me one on one. 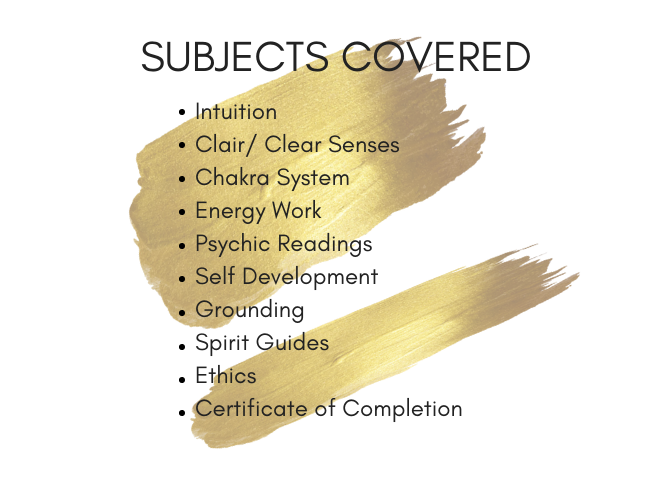 The private course caters more to you the student as I help you personally with develop your skills as a Psychic and/or Medium. Create your own schedule with this program. If you are limited on time and wish to take it a little slower then this option will allow you to learn all your lessons privately in your own time. Engage with other students and receive direct live teachings through Zoom conferencing held in the second half of the course. You will also receive a bonus Facebook Live session before the live conferences. You'll be able to ask your teacher questions as well as have the opportunity to do more exercises that are not available in the self study version of this course. You will receive extra content and will be presented with a certificate of attendance upon completion of this course. This course contains all content from the group class. You will also receive private mentoring with me to really advance in your Psychic abilities and spiritual development You will be able to really advance and receive my full attention as I guide you within your personalized course. You will receive extra content and will be presented with a certificate of attendance upon completion of this course.